BHD syndrome can cause kidney cysts and kidney cancer. 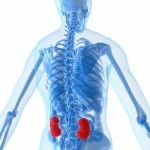 Kidney cysts are fluid filled sacs that develop in the kidney. By themselves, they are not harmful, but they can develop into tumours, so it is important to keep an eye on them. BHD patients can also develop multiple kidney tumours, but in most cases these tumours grow very slowly, rarely spread, and are not life-threatening so long as you get appropriate treatment. It is recommended that BHD patients have an abdominal scan roughly once a year, and any tumours are removed once they reach 3 cm. There have been a handful of deaths caused by BHD kidney cancer. However, in most cases, these patients did not know they had BHD, and didn’t find they had kidney cancer until very late in the course of the disease. This is why it is very important to have the genetic test to find out if you have BHD. If you know you have BHD, you can get regular kidney scans and tumours will be found and removed when they are small. It is exceedingly rare for people to die from BHD kidney cancer if they are being treated in this way.